Mühle Shaving Company is a company that is known for their high- quality products for wet shaving. So what’s behind this brand that makes it so fine in quality? Mühle says; “Our high quality standards are based on our product development, the selection of excellent materials and their traditional processing.” In 1945 Mühle made their first shaving brush in Stutzengrun, Germany. Their products are so well crafted by specialists. Each specialist profits from their craftsmanship. Mühle tells us that “the result is beauty and durability.” The final product is assembled by hand placing the individual components together carefully. Once the final product is assembled, each one is then scrutinized before it is passed on to the new owner. Mühle is well known for their shaving brushes and their quality but what’s really behind this all. The hair qualities are silvertip badger, silvertip fiber, best badger + fine badger, pure badger, black fiber and pure bristle. Each quality brush has its own individual advantages. 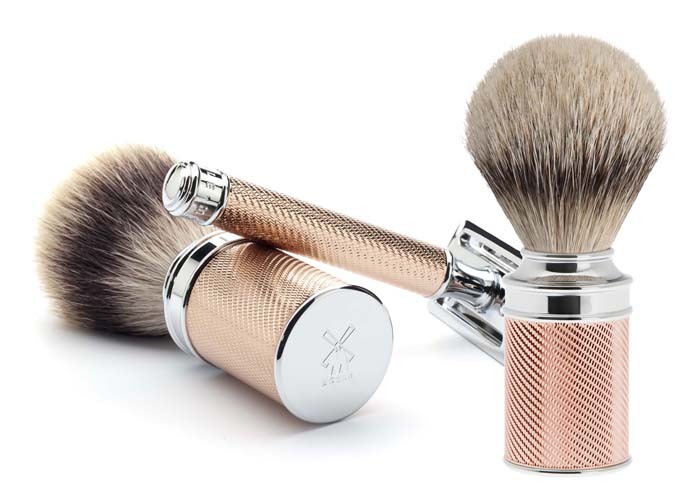 You can read more on each one here: Mühle Shaving Brushes. The shaving brushes were made in a wash-house. This is where the logo was born and placed onto the handles of the brushes. Mühle means mill and a mill is a factory for certain kinds of manufacture, as paper, steel, or textiles according to dictionary.com. Mühle opened a small historical museum in 2006 where you can stroll the 200 years or related wet shaving information and tales about the art of shaving. The history of Mühle is absolutely impeccable. This is not only a quality product company but it is all about craftsmanship and the people. They have really carried and amazing generation of quality products and craftsmanship. concerning this subject and didn’t know wwho to ask. ong time. Excedllent stuff, just great!